The Brevard College rock climbing team recently staked its claim as a force to be reckoned with on the national competition stage, and USA Climbing took notice. On Feb. 6, the team of 18 students traveled to The Crag in Franklin, Tennessee, for the Nashville Collegiate Climbing Regional and scaled their way to second place.The win positions the team on track for a spot at the Collegiate Climbing Series National Championship April 22-23 in San Diego, California, according to team founder and staff advisor Travis Gray. “(It will be) an opportunity to prove once again that we are a competitive collegiate rock climbing team on a national level,” Gray says. For the past three years, Brevard College Climbing has made a name for itself by pulling out wins in competitions throughout the Appalachian Region, the collegiate region under USA Climbing, which includes schools in North Carolina, Kentucky and Tennessee. 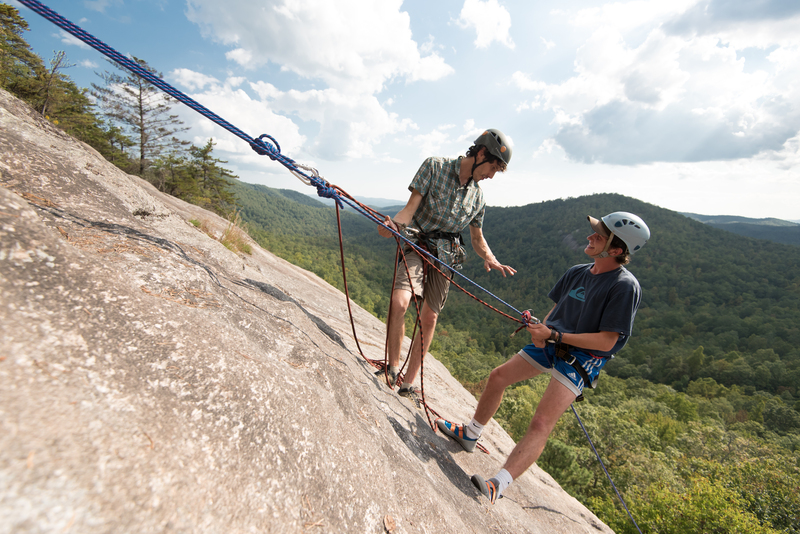 Despite Brevard College’s small student body, the climbing team is one of the largest in the Appalachian Region, which, Gray says, gives them an edge over other schools. The team practices at Brevard Rock Gym, just down the road from campus and owned by BC faculty member Cameron Austin. Austin’s son, Kendrick, 13, competes for USA Climbing on the gym’s Competition Team, a team with an impressive three appearances at national level competitions in as many years. Team President Audrey Ashburner is one such leader whose enthusiasm helped the team gain momentum after she took over the helm.One of Brevard College Climbing’s biggest challenges is that it is a club and not an official Brevard College athletic team. The team is sponsored through the Student Government Association, and gets just $315.25 in funding. In contrast, Ashburner says it will cost around $7,000 for the team to compete this season. Ashburner says one of the team’s strengths is a high level of organization.They have an office and manage their own bank account. They must solicit their own members, sponsors and additional funding. They have an elected executive board of six. Team placements are determined by a combination of individual team member efforts and how well a team as a whole performs at a competition. Climbers compete in four categories: recreational, intermediate, advanced, and open. Climbers are allowed to climb any marked routes, but they must complete five routes within three hours for their score to count. In Franklin, the top finishers for BC were Eli Hyatt, who placed third in the recreational category, and Luke Lundquist, who took home second. Gray says this “grassroots” team has encountered an incredible amount of adversity, earning their success outright. The climbing team has four more competitions on the slate, including one at Brevard Rock Gym March 12. To learn more about the team, follow them at facebook.com/brevardclimbing.The climbing team will be holding a Coffee and Arts Fundraiser to support its expenses, including travel to and from competitions, on Sunday, Feb. 21 from 2 to 8 p.m. at the Coffee cARTS Studio, 1061 Rosman Highway in Brevard. Donations can be made at gofundme.com/brevardclimbing.